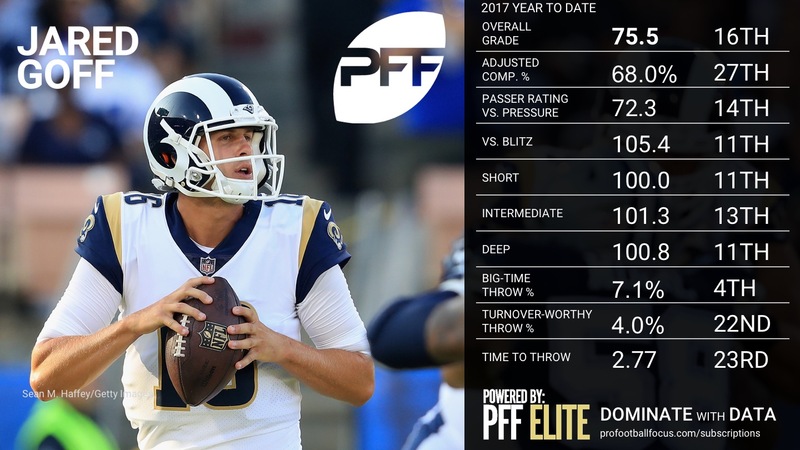 Every week at PFF we will give you a grade and statistical update on all NFL quarterbacks. 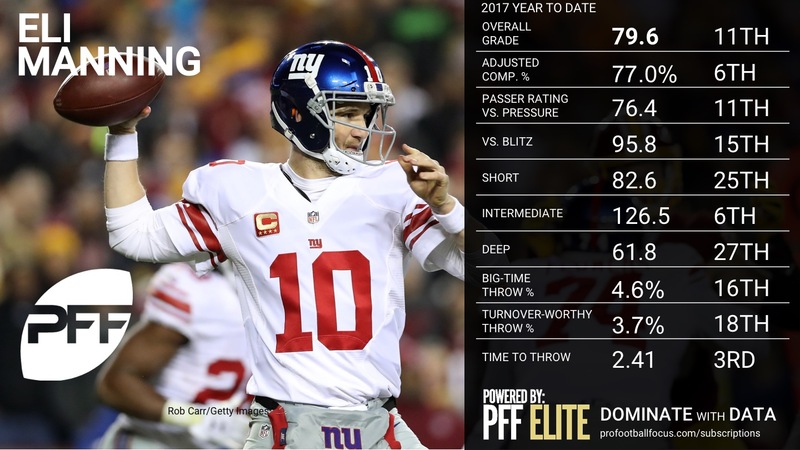 Each image contains a number of traditional and advanced stats, including, of course, overall PFF grade which can be found as part of a PFF Edge subscription. 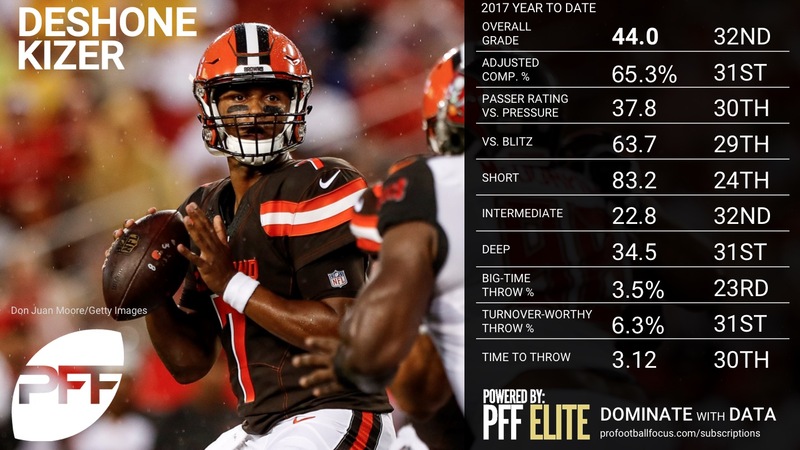 Early in the season, sample sizes are small and numbers can vary greatly, so for that reason, the quarterbacks are organized by division for the first few weeks. 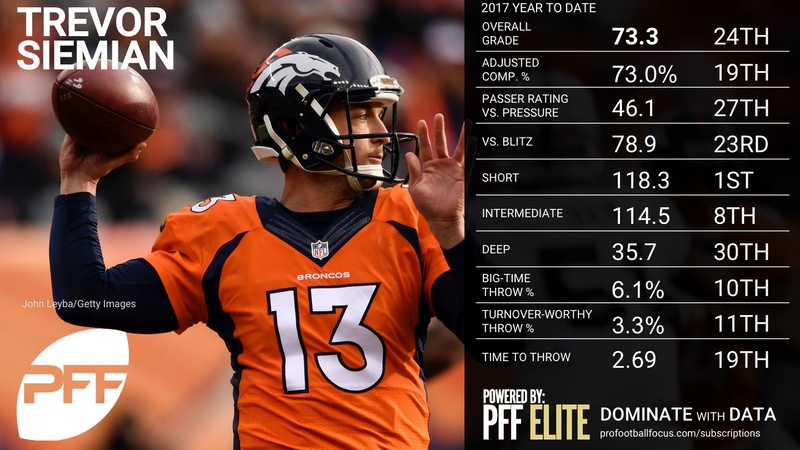 Full quarterback rankings through Week 5 can be found as part of PFF Edge. 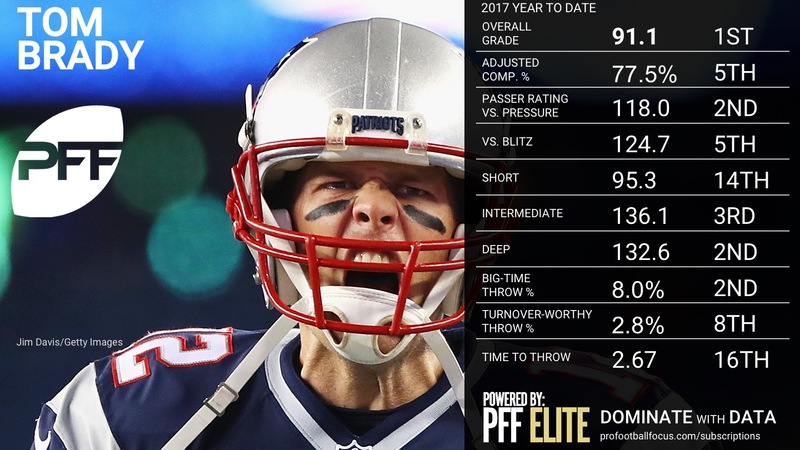 Brady started out slow with a poor middle-of-the-field overthrow for his first interception of the season, but he settled down to have another strong game against the Buccaneers. 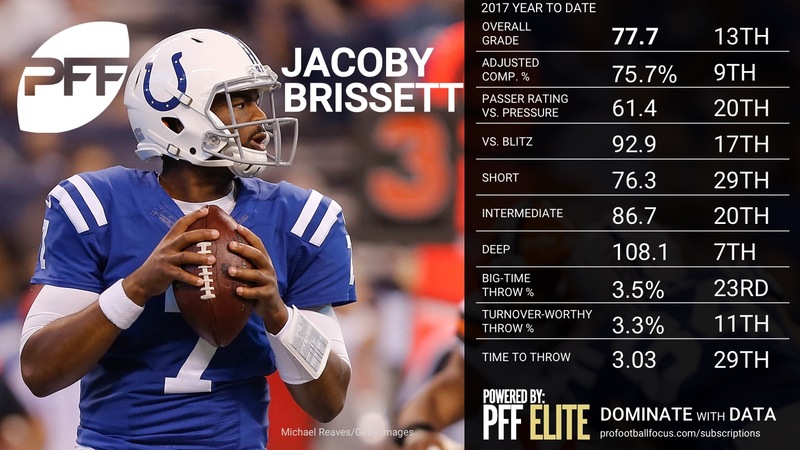 He had multiple big-time throws down the field, including a wheel route to RB James White and a deep crossing route to WR Brandin Cooks while also showing efficiency in the short game going 15-of-19 for 105 yards on passes thrown between one and 10 yards down the field. 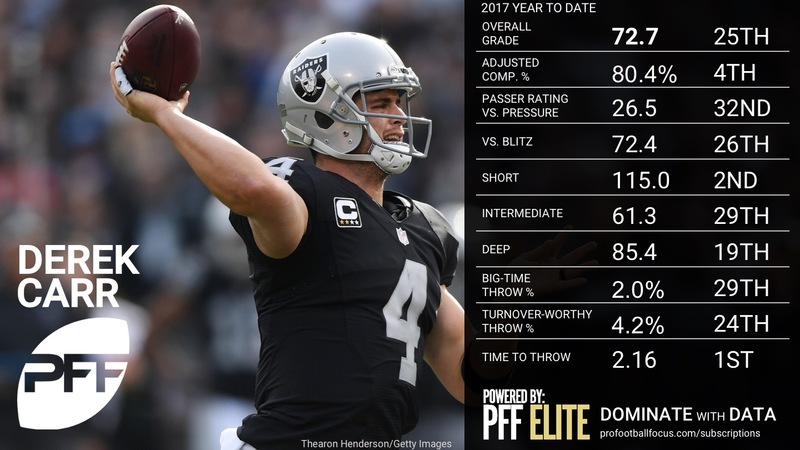 Flacco and the Ravens saw by far their best output of the season, finding the holes in Oakland’s variety of zone coverages. He got started off on the right note, with the first play of the game finding Mike Wallace on a well thrown ‘go’ ball for a 52-yard gain. Later In the second quarter, he again found Wallace behind the secondary off play action for a 54 yards. 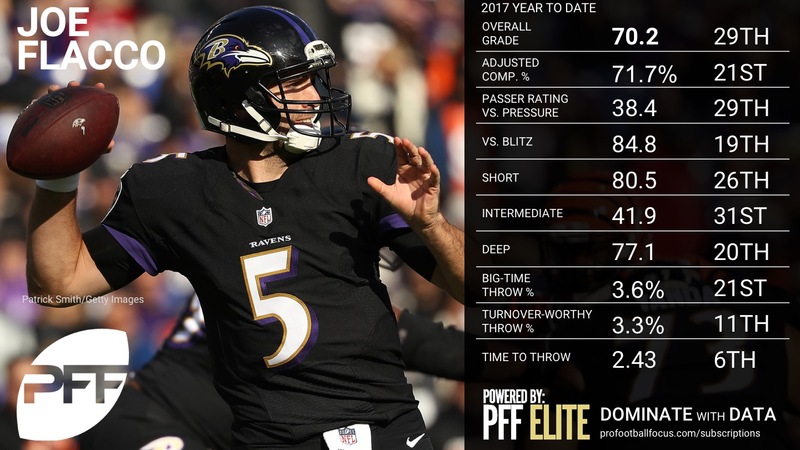 Flacco’s efficient day can be largely attributed to the offensive line, who kept him clean on 84.6 percet of his 26 dropbacks, best in the NFL this week. 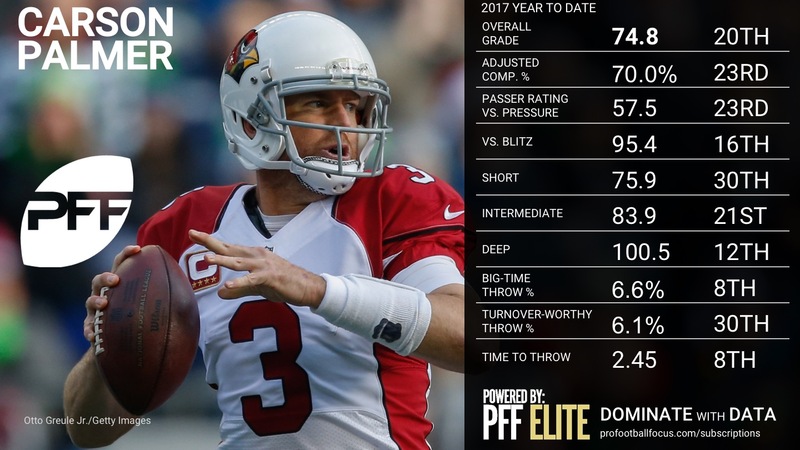 Roethlisberger had an off day all around, hesitant at times in the pocket with his reads and his ball location under pressure just off on a number of plays resulting in interceptions. 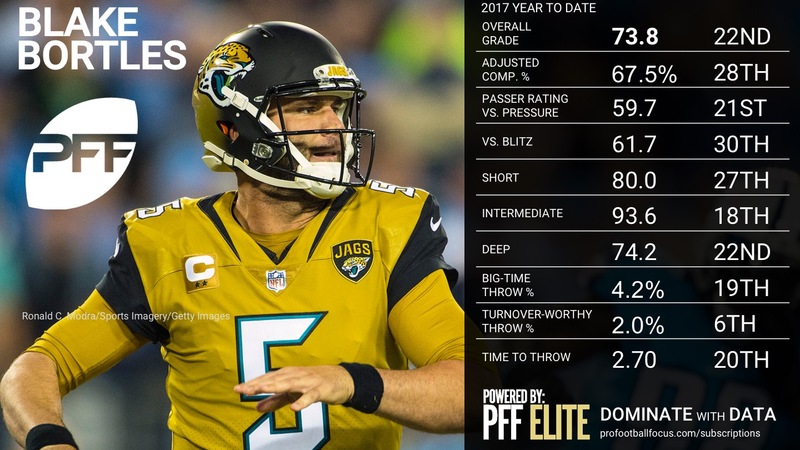 The Jaguars rushed four and sat back and played coverage on just about every snap, with just two blitzes coming on his 58 dropbacks. 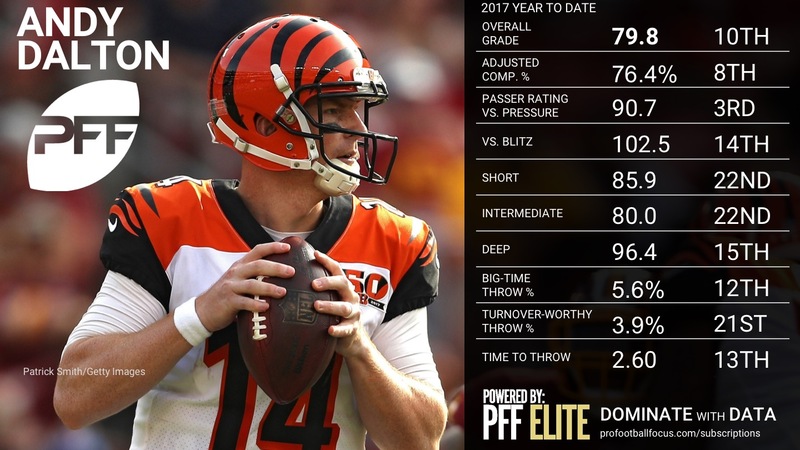 Roethlisberger struggled under pressure, completing just 40 percent of his passes for 25 yards, no touchdowns, three interceptions and an 8.3 passer rating. 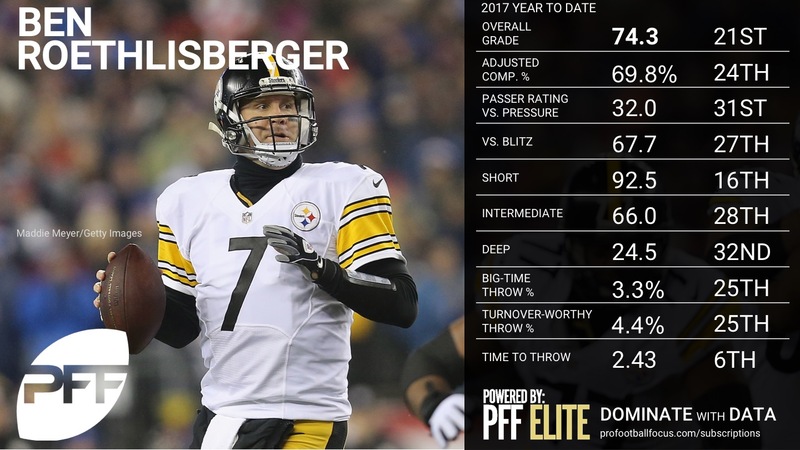 The Steelers offense must start finding big plays down the field more consistently, as Roethlisberger is just 5-of-27 for 183 yards, 0 touchdowns and two interceptions and a league low 24.5 passer rating on throws traveling 20-plus yards in the air. 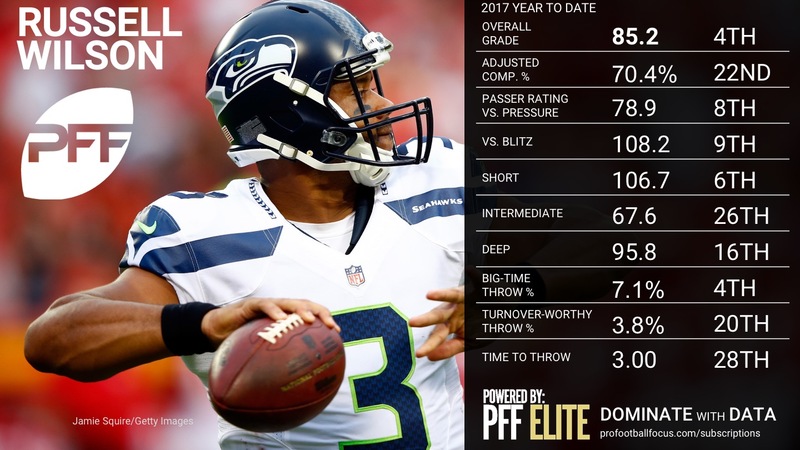 It’s been the one of the most consistent themes this season, but once again Smith was solid and efficient all the way through the game mixing in big plays down the field, key scramble throws and taking care of the ball. 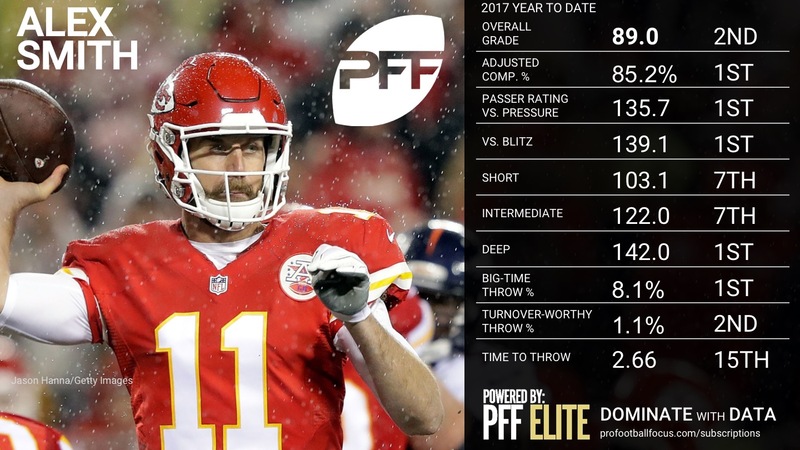 The NFL leader in Big Time Throw-to-Turnover Worthy Play ratio found Travis Kelce on two big time throws down the seam against split safety coverage for big gains. 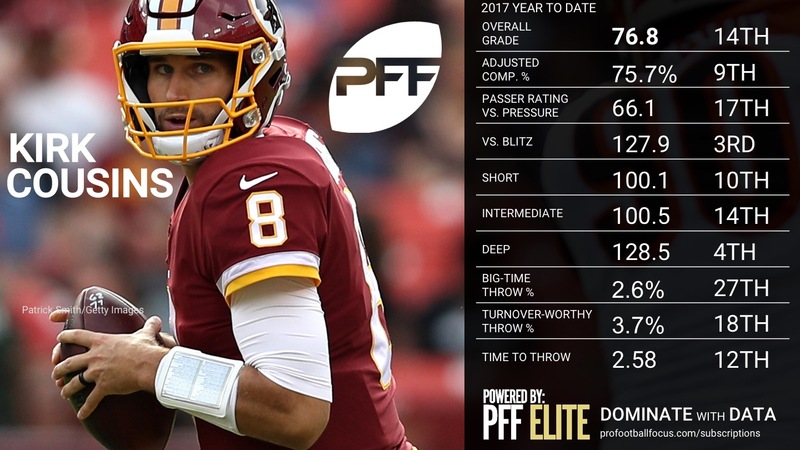 Not only is Smith doing what he does best and leading the NFL in completion percentage in throws under 2.5 seconds or less at 82.2 percent, but he’s extending plays as well as anyone. 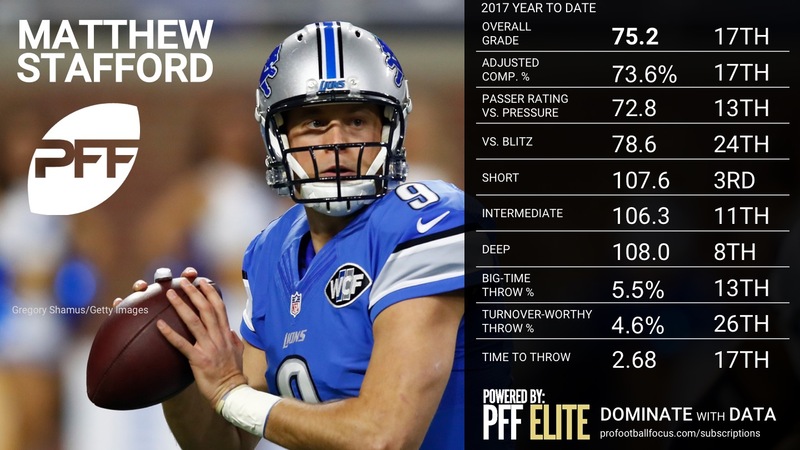 Smith leads the NFL in passer rating on throws plays lasting 2.6 seconds or longer with a clip of 131.8, 17.0 points higher than the next competitor. 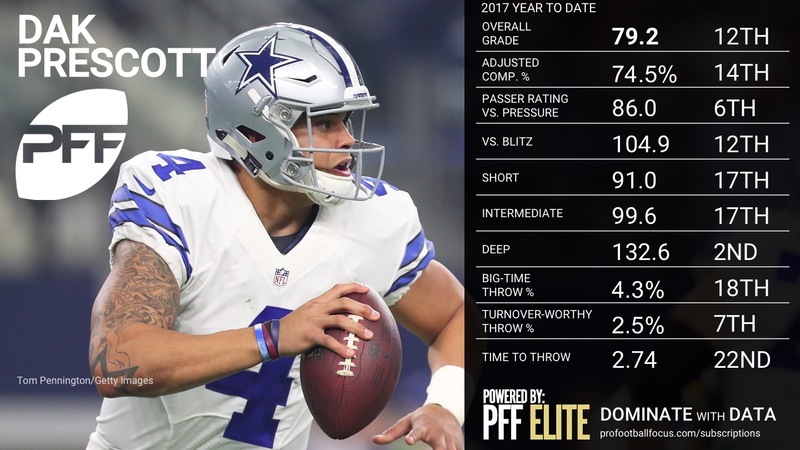 Prescott came out on fire, particulalry in the red zone where the Cowboys used run/pass options to give him clean looks and he came through with pinpoint accuracy and three early touchdowns. 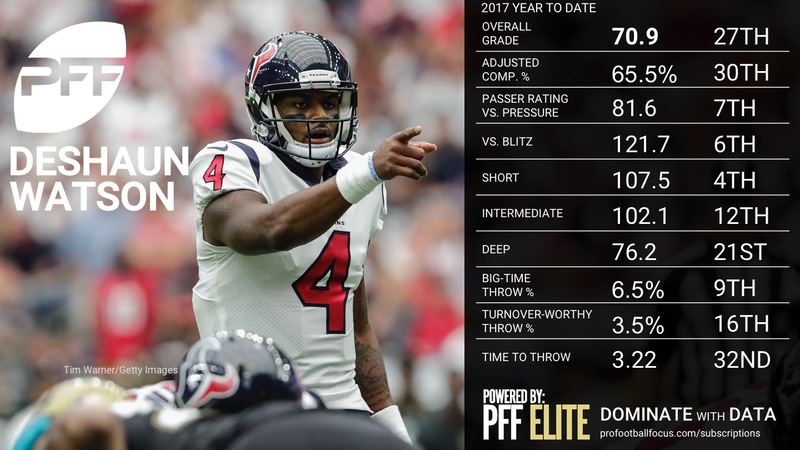 He got away with one poor decision, throwing back across his body, but that was offset by an unlukcy pick-6 in crunch time. 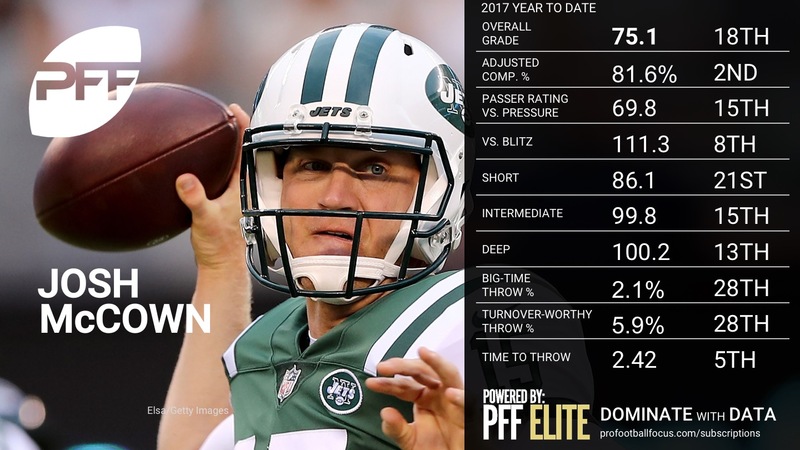 Like Aaron Rodgers, Prescott came through in crunch time with the go-ahead touchdown run, but it left too much time on the clock for the game-winner in what was a fantastic duel between two of the league’s best quarterbacks. 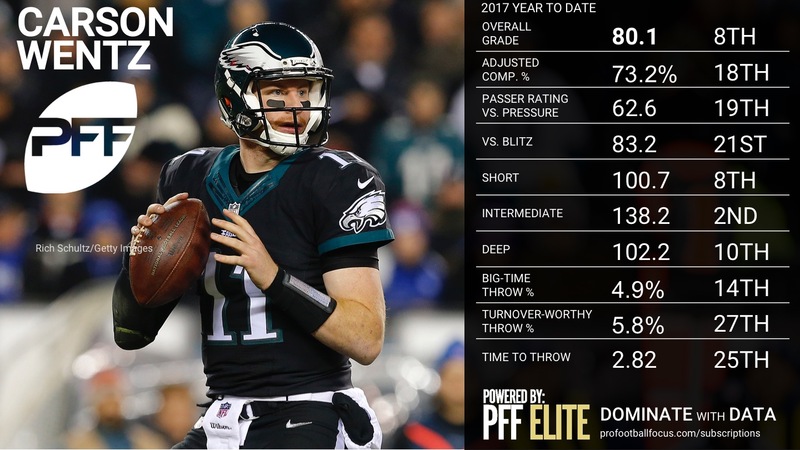 Wentz was efficient throughout the game operating the Eagles quick passing attack with a number of RPO’s, quick game and hitting big time throws down the field. 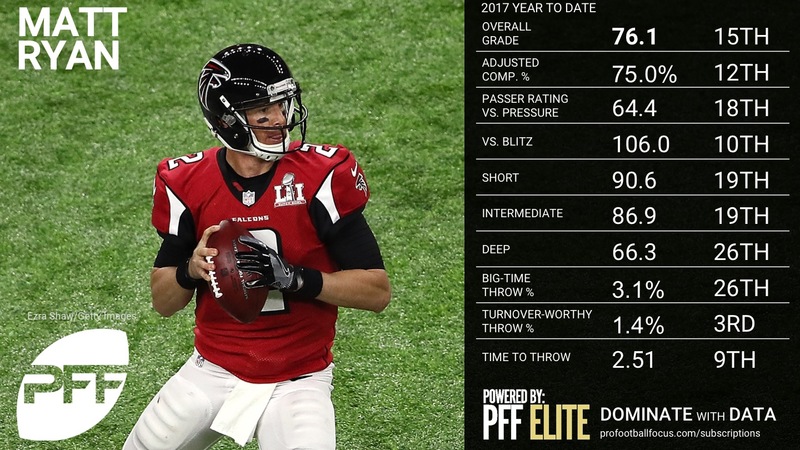 Wentz found the void in the defense hitting Torrey Smith on a post for a 59-yard touchdown in the first quarter, but by far his most impressive play came in the third quarter on a third and 19 against an all out cover-0 blitz where he felt the rush, pushed up in the pocket, and delivered a strike on a deep cross to Nelson Agholor, who danced around the defender for a touchdown. 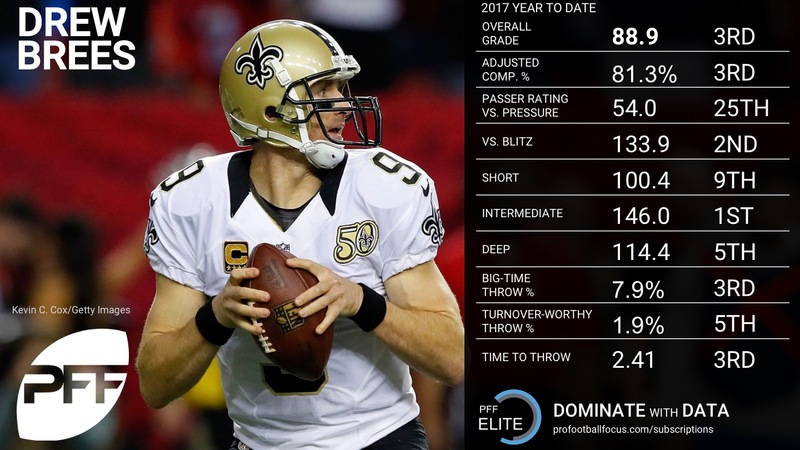 His lone big mistake of the game was an out and up attempt to Zach Ertz where he lead S Antoine Bethea with his eyes resulting in an interception in the end zone at the end of the first half. 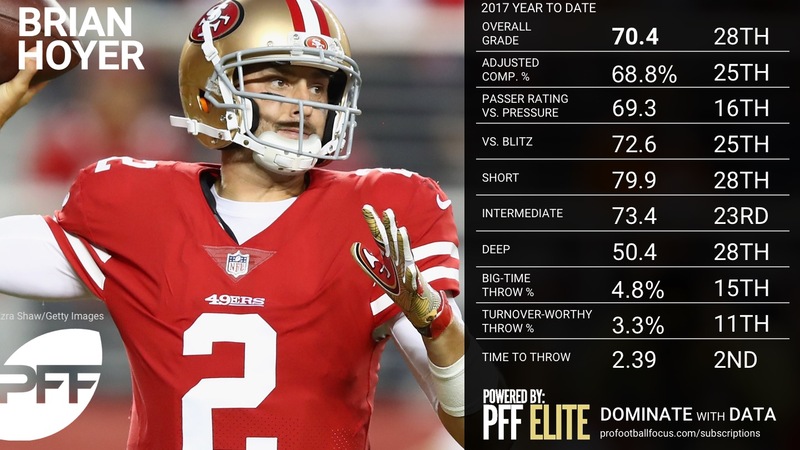 Making his NFL debut, Trubisky flashed what led him to be the second overall selection in the draft quickly on his first drive with a number of accurate throws from the pocket and perhaps his best throw of the night throwing on the run on a corner route that was negated by a penalty. 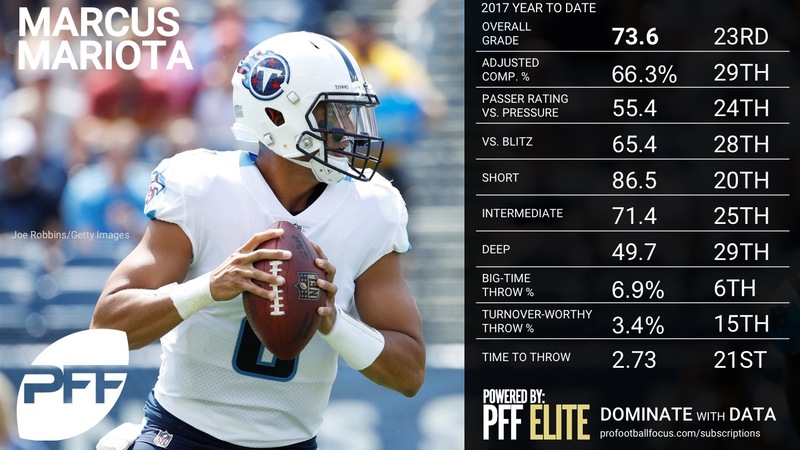 There were a number of ups and downs throughout, which are to be expected, as Trubisky struggled against the blitz and especially under pressure where he was 1-of-7 for 9 yards. 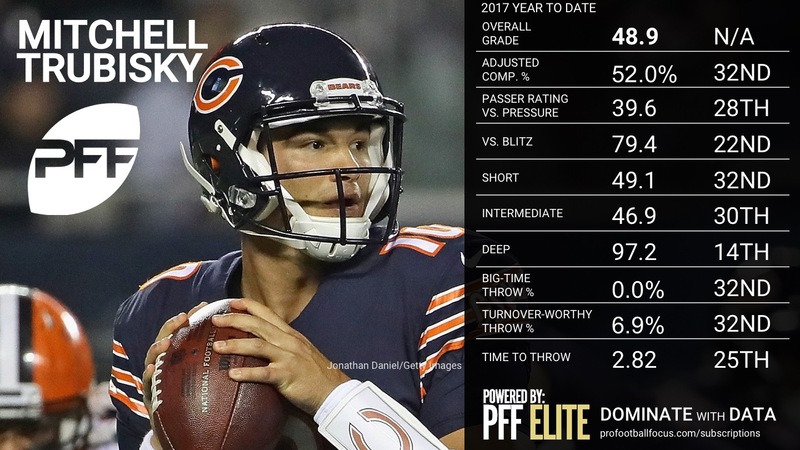 Trubisky’s big mistake came at a crucial time with the game tied in the fourth quarter, where Harrison Smith undercut Zach Miller as Trubisky tried to force a throw scrambling to his right. 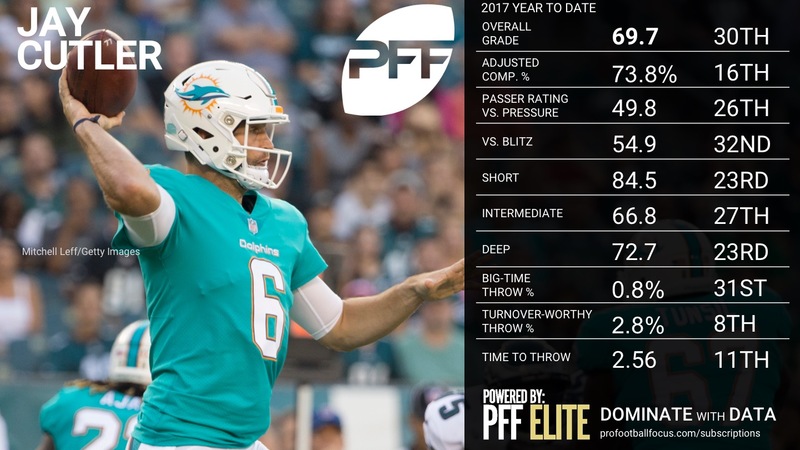 Overall, there were enough positives in this game for Bears fans to have hope for their franchise QB. Another classic game for Rodgers as he came through at the end with a #bigtimethrow for the game-winner. 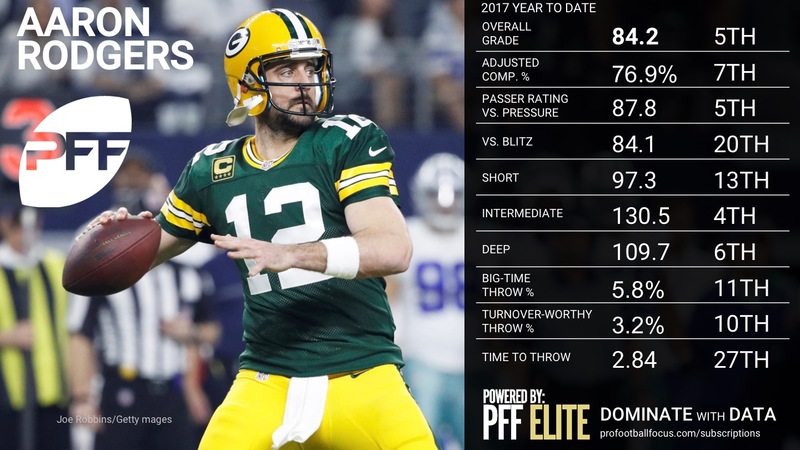 On passes thrown at least 10 yards in the air, Rodgers went 7-for-11 for 119 yards and three touchdowns, showing his usual wizardry in the red zone. 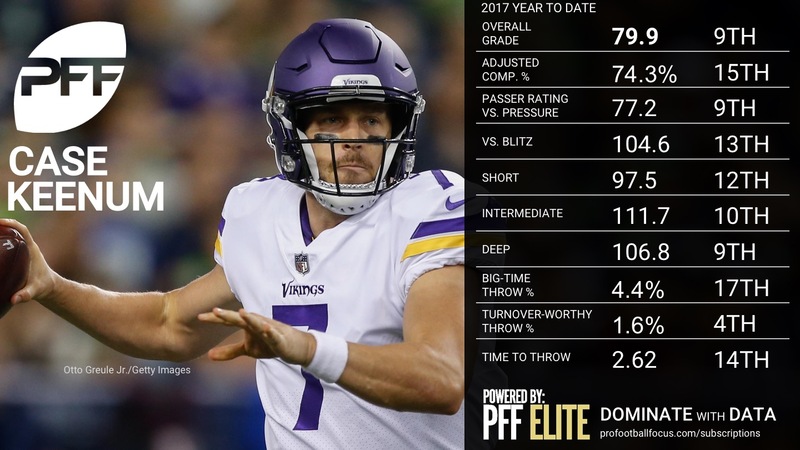 After an uncharacteristic slow start the first two weeks, including a number of turnover-worthy throws, Rodgers has settled back in and has only two turnover-worthy throws over the last three games. 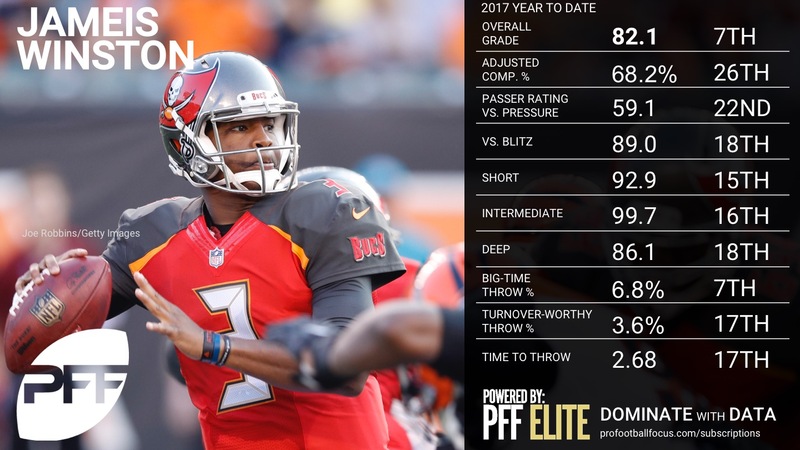 More boom or bust for Winston this week against the New England Patriots as he struggled through three quarters before nearly leading a comeback on the back of multiple big-time throws. 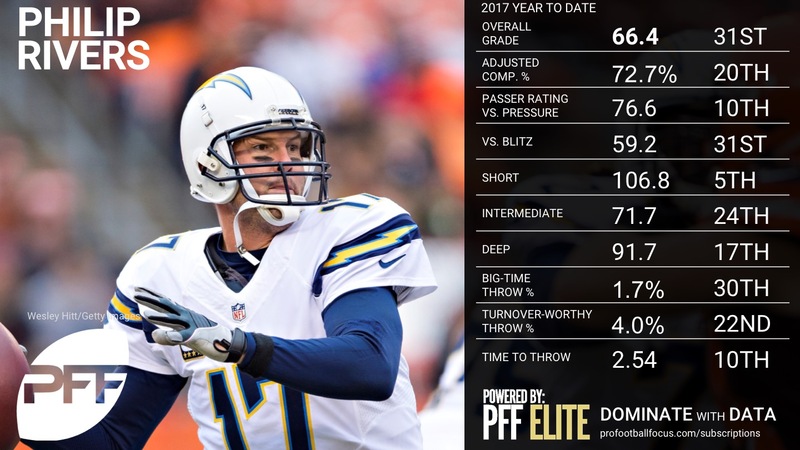 Winston has the highest percentage of positively-graded throws in the NFL but also the second-highest percentage of negatively-graded throws, perfectly summing up the highs and lows that are associated with his game in any given week. 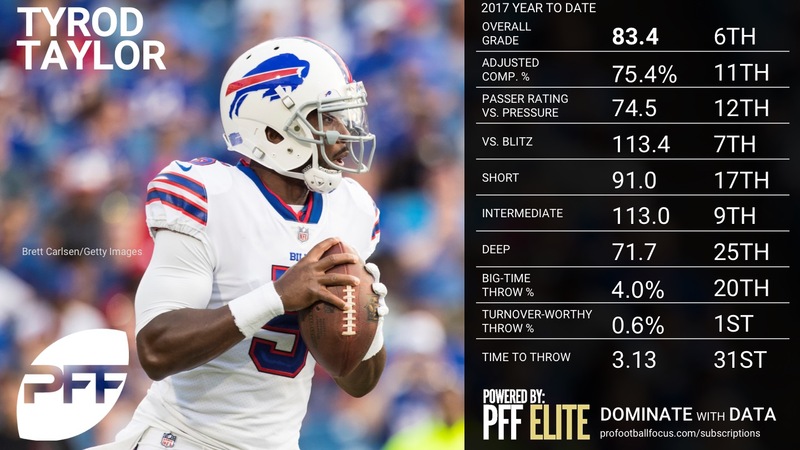 It was the second strong game in a row for Newton and maybe his best pure passing effort in a while as he finished 26-of-33 for 355 yards with three of his seven incompletions being dropped. 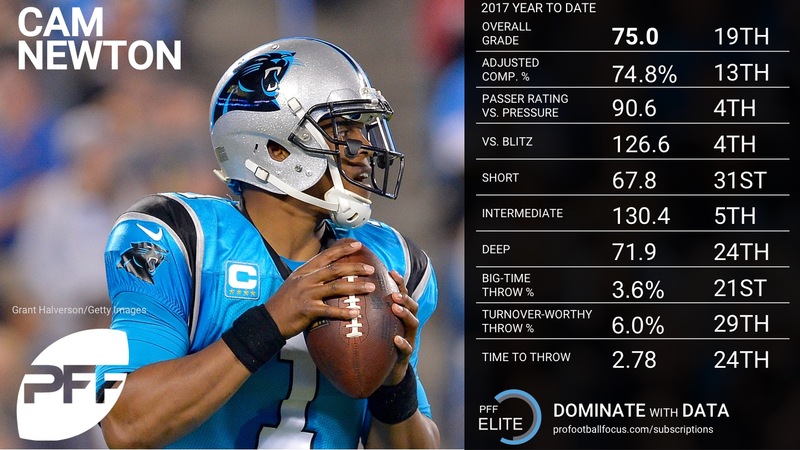 On passes thrown at least 10 yards in the air, Newton went 9-for-11 for 248 yards and two touchdowns, as he looks far more comfortable after struggling through the first three weeks of the season.